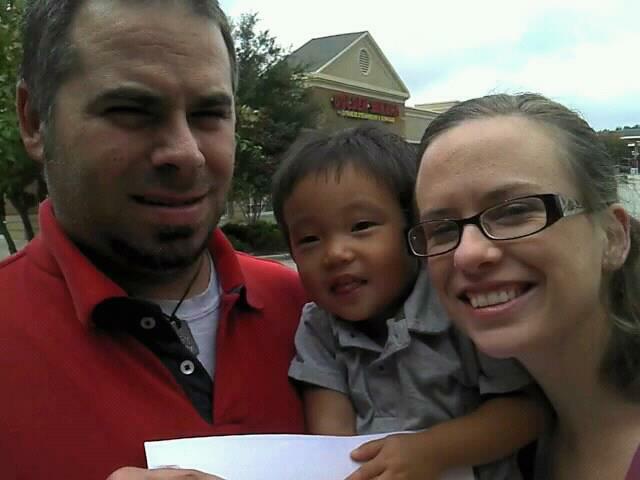 Today was the day we took custody of Samuel forever! Before we left for our agency we were able to skype with some of our family. That was helpful for our nerves! We knew people were praying for us. We really weren’t at SWS very long. We met Ms. Sun, the international director of SWS. She was very nice & gave us a gift. It’s a little lacquer box that is beautiful! We received a bag from SWS that had clothes, bottles, formula, diapers, a Korean flag, a necklace for Samuel, children’s cds, & a few other things. This day was emotional! Samuel did great. He didn’t really know what was going on. He didn’t cry, but I was knowing what was happening. We took him from everything that he knows. The language, his foster family, the smells & sights of Seoul, & his birth country. It was very hard, but we are so thankful that he is ours! In the cab he fell asleep & slept most of the ride to the hotel as well as some at the hotel. Then he woke up & we played then went for a walk. The day consisted of a lot of play time, walks in the carrier, & many firsts. 🙂 Samuel was such a happy boy & did great! He did get upset near bed time. It was the most pitiful thing! We loved him so much, but didn’t know how to help him grieve. We gave him a bath, changed him, & gave him a bottle. He fell asleep crying. 😦 He did well throughout the night & only woke up for a bottle. The hardest part was knowing we loved him, but didn’t “know” him yet to be able to console him. We didn’t really know the exact things to do to help him feel better. This day was very exciting in Seoul! We met our son for the first time! We were very nervous yet excited at the same time. We rode the subway to SWS & then rode with the social worker to the foster family’s apartment. It took about 45 minutes to get to the foster family’s home. We had a great time at the foster family’s home & getting to talk with them. I made a list of questions to ask the foster-mother so I wouldn’t forget. When we got there we saw the sweetest little bundle asleep on the floor. It was his nap time. The foster-father was there as well & after a little while of talking he started calling Samuel to wake him up. He started yelling “Hobum, Hobum!” I felt bad, but really wanted to see him as well. He woke up all smiles! He stared at us for a few minutes first & then really started smiling & playing. We were supposed to get Samuel forever on 10-13, but the social worker asked us when we would like to get custody. I was thinking in my head now! She could probably see that on our faces, so she said tomorrow or the next day? Of course we said tomorrow! So, we got our baby boy a day earlier! Last year on this day we woke up extremely early in the morning. It was around 3 or 4 in the morning. We had jet lag & weren’t used to the time difference yet. I’m sure nerves had a role in this as well. We only had 1 more day until we met our son! We did end up going back to sleep though. After taking our time getting ready we decided to go into town & take the Seoul city tour bus. I’m thankful we did this! We were able to see the National Museum of Korea & the N. Seoul Tower. I’m sure we could have found our way via the subway, but this was so easy. The Museum of Korea had a lot to look at! Beautiful art, sculptures, & pottery. We also learned a little more about Korea’s history. The N. Seoul Tower was very special for us. There is a lock with a note attached to it just for Samuel. I hope that we can go back one day to show Samuel & possibly even look for his lock. Even though it was cloudy, the view was beautiful! Some days you can even see part of North Korea. We will always remember that steep hill we had to go up to get to it & then come down after we were done. There’s definitely a lot of walking in Korea! Whoops! I think I’m a little off on the timing of my posts! They’ve been a day early. I KNOW the dates in my head, but got thrown off by the post date on my blog, the time difference, & the day of the week that things happened! I was going by the actual day of the week & not the date, due to the time difference. Oh! So, tomorrow look for Flashback: Seoul day 3!